This is a head of garlic. 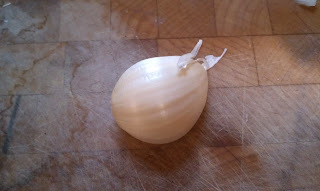 This is a clove of garlic. I just pulled it off the head. 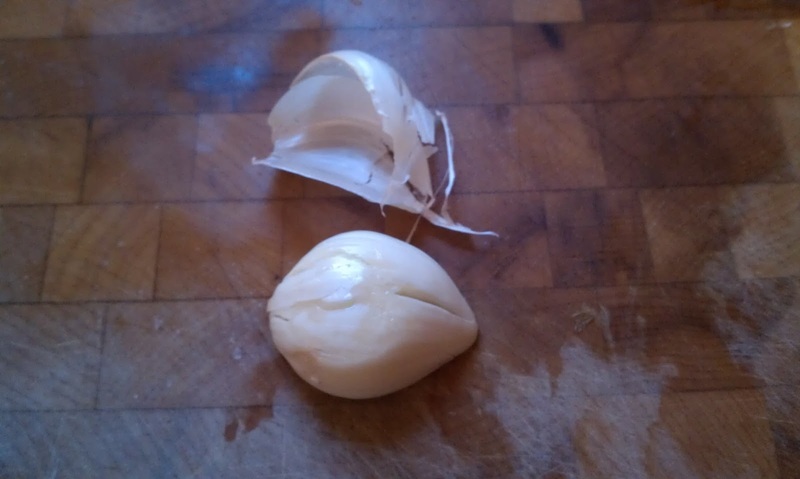 This is a whole head of garlic, separated into cloves. Well, that was helpful, wasn't it? Seriously, this is pretty obvious to a lot of people. Others, not so much. I have been surprised at the number of people who don't use garlic, only use it from a jar they found in the refrigerated case of the produce section, or think of it as somehow exotic. I use garlic all the time. It's one of my favorite ingredients. It is prominent in so many different cuisines. Italian (the obvious), French, middle eastern, Indian, Chinese, Thai, Mexican.....I am sure the list would go on and on. Off the top of my head, I can't think of any cuisine that doesn't use garlic. And I am not sure I want to know. Oh, garlic is so good. I know the reputation it has. They say not to eat anything garlicky on a date, because you wouldn't want to smell like garlic. I have two problems with that advice. So single ladies, listen up. 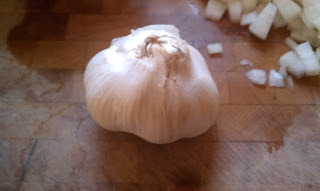 First, the notion that garlic smells bad is one of the most confusing bits of conventional wisdom that I have heard. 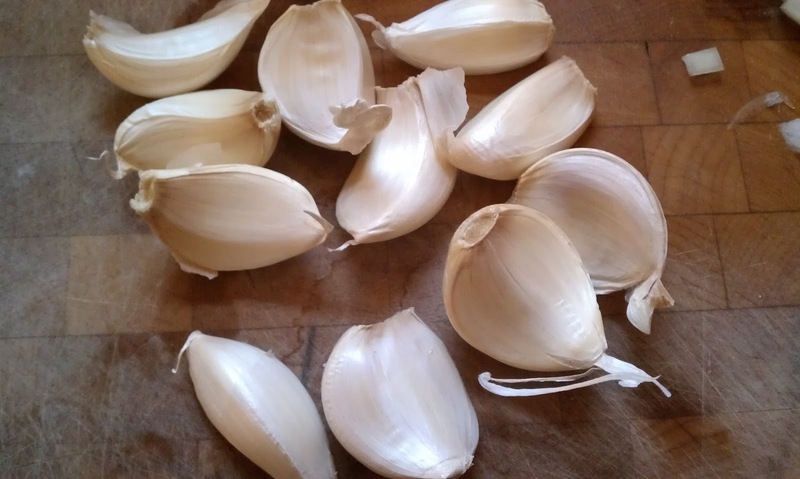 Okay, so if you chew on a raw garlic clove, your breath is going to smell kind of acrid. But I haven't seen too many menu offerings with raw garlic as a listed ingredient. Once you saute or roast garlic, the aroma is absolutely amazing. In fact, my number one, all-time favorite culinary aroma is garlic and olive oil warming together in a pan. If you are worried about breath, well, chew on a mint after dinner. There is no long-lasting effect on your breath after eating garlic. And it will not seep from your pores. But more importantly, if you are dating a guy who minds the smell of garlic, you don't want to continue down that path, anyway. There is nothing better than fresh garlic. I do use garlic powder when seasoning beef, but that is always in addition to fresh garlic, not in place of it. I haven't ever used garlic in a jar. It's just too expensive, and I have a feeling that it would get much too harsh and bitter, sitting in its juices all that time. 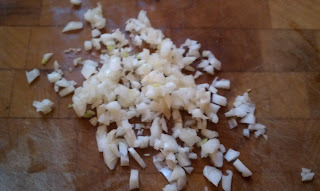 Besides, I use garlic in many ways, not just minced. Sometimes I just smash the cloves of garlic and put them in a cup or so of olive oil, and warm it all over low heat for quite a while, so that the flavor of the garlic is infused into the oil. Makes a great pizza crust flavoring, or a quick dressing for pasta or salad. It works for garlic bread, too. Plus, your house will smell amazing. And the cloves don't go to waste. After all that time in the oil, they are soft and mild, and perfect for smooshing into mashed potatoes or spreading over bread. Or cook until it's just past the spreadable stage and chop it up to sprinkle over pizza or add to sauces. If you are using garlic to flavor a sauce, you can make it a little milder by simply slicing the garlic, or stronger by mincing it. The smaller the pieces, the more it tends to impart its flavor. Of course, that's only one factor. If you are cooking the sauce a long time, it won't make much difference. But for a quick pan sauce with a little garlic flavor, go ahead and use slices. So for those to whom garlic remains a mystery, let me show you how simple it really is. 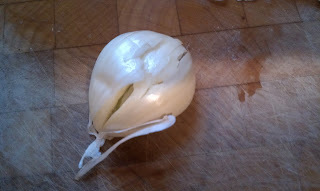 Once again, this is a head of garlic. And a pretty good one, at that. When you pick out garlic, look for large heads (they are usually priced by the unit, not by weight, so get the biggest ones you can for the money), firm, filled-out skins, and cloves that seem to be on the large side. There is nothing wrong with smaller cloves--you can just use 2 or 3 small ones and count them as one for a recipe. The only problem I have is that each clove has to be peeled, so if you want less work, look for large cloves. Sometimes the little buggers can be tricky, though. What looks like one clove bump will turn out to be two or three cloves. Nothing you can do. Sigh and start peeling. The other thing to avoid is any sort of sprouting. I'm not talking about the dry, hard stem that sometimes sticks straight out of the top. Usually, that is cut off, but sometimes you will see it still present. It's not a problem. You want to avoid the green sprouts. It means that the garlic is old, and will most likely be dried out a bit, and less pungent. However, I have often heard that, if your garlic cloves start to sprout after purchase, you should throw them away because they will have become bitter. Not true. 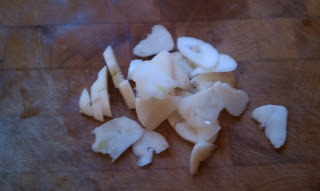 Simply cut the peeled clove in half, root to tip, and pull the sprout away. The sprout itself is bitter, so you don't want to just mince it up with the garlic. But the surrounding garlic won't be affected. The worst that will happen to it is that it might lose some of it pungency. No big deal. 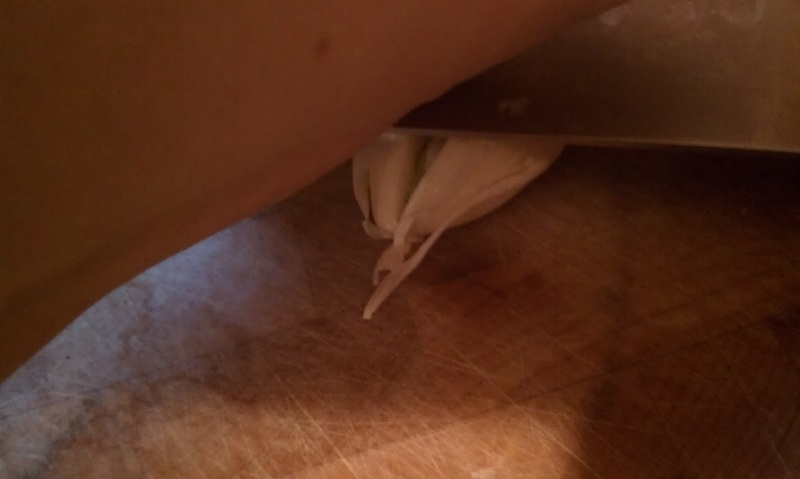 Lay the garlic clove on your cutting board, on its flattest side. You need to smash the garlic. You can use a heavy can, the bottom of a glass, or anything else heavy. Just smash away. I use the side of my knife, since it's already out and ready to use for slicing or mincing, anyway. If you use your chef's knife, just remember the most important safety tip: angle the blade downward! To start out, lay the blade over the clove so that the dull side faces you and the sharp side is touching the board. Eventually, you will get a feel for it, and you won't need to touch the board anymore, but always, always, make sure the sharp side is angled toward the board and away from you. Now, hold the handle of the knife to keep it steady, and use the heel of your other palm to whack the flat of the knife down onto the garlic. Is that a common term? Heel of your palm? Hmmm....I'm suddenly a little unsure. If not, I'm talking about the part that is just above your wrist. For one thing, it's the strongest part of your hand--it's really the strength of your arm at work. But more importantly, you can still hold your fingers and the rest of your palm up and away from the knife. Okay, maybe I'm making this sound scarier than it is. 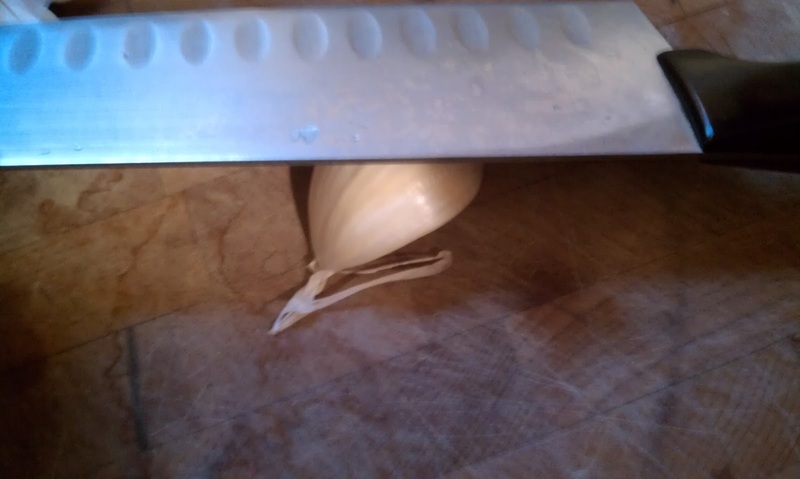 I have never had a single problem using my knife to smash garlic. But perhaps that is precisely because I am pretty careful about it. So....use the knife, but be careful. There it is. 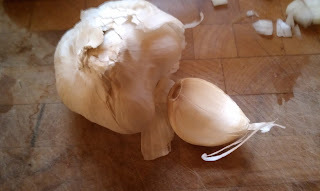 One smashed clove of garlic. Why smash it? Well, because it somehow releases the tightly wrapped skin from the clove. If you have ever tried to peel garlic like you do an onion (guilty), you know that it is a maddening activity. However, once the clove has been smashed, the skin slips right off, often in one piece, like a jacket. It's SO much easier. Here's a tip: If you are using lots of cloves of garlic, you might want to get all of them smashed, then peeled, before moving on to the next step. Garlic is sticky stuff. If you smash, peel and mince each clove of garlic before moving on to the next, you will find that the papery skin will stick to your knife, your fingers, the board.....it's a mess. So just smash them all and rinse off the knife, then peel them all, and rinse off your fingers. Then the peels are out of the way and you can move on to slicing or mincing. or pile up the slices and run the knife through them a few times, until you have as coarse or fine of a mince as you like. See? It's easy. And once you try it, you'll see how much tastier your food is with fresh garlic. Plus, it's supposed to be good for you. Heart health, immunity.....well, okay.....that's not really my thing. But I hear good things, and it can't hurt, right? Now what other ingredient can be so versatile, so tasty, and so healthy, all while remaining one of the cheapest items in the grocery store? Try fresh garlic! Brine: The Weird Idea That Works!